POLARIZED LENS ▶ Polarized sunglasses can be eye protection effectively filter & block glares, that let your eyes are more comfortable and you can see more carefully. Designed for driving & outdoor activities. 100% UV400 PROTECTION ▶ 100% protection against UVB and UVA rays, blocking any harmful ultra violet light rays beyond 400 nanometers. UV 400 protection means that Kennifer sunglasses has been optimized to exposure to both UVA and UVB radiation so that can be protection for your eye. 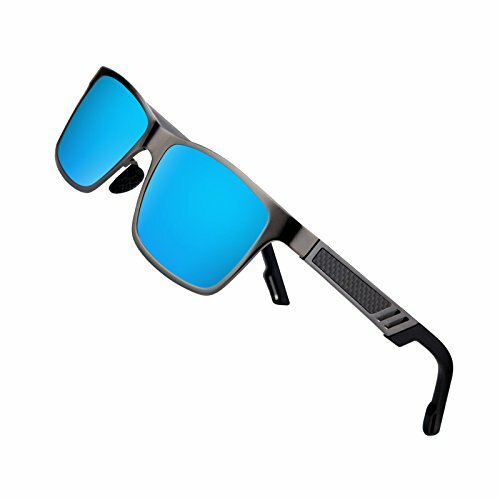 HIGH QUALITY FRAME ▶ Made with Al-Mg materials, these sunglasses were constructed using special design techniques in order to ensure durability and avoid breakage while engaging in sports and recreational activity. 30 DAY MONEY BACK GUARANTEE ▶ All customers enjoy 30 Day Money Back Guarantee. Customers can return and get refunded in case the purchasing is not satisfactory for any reason. You have no risk to try and we will provide you the best service! If you have any questions about this product by Kennifer, contact us by completing and submitting the form below. If you are looking for a specif part number, please include it with your message.